The researchers at the Chalmers University in Sweden have succeeded in making acoustic waves couple to an artificial atom. For the first time, scientists have used sound to ‘talk’ to an artificial atom, demonstrating a curious phenomenon in quantum physics that sees sound waves take on the role of light. The interaction between atoms and light is well known and has been studied extensively in the field of quantum optics. However, to achieve the same kind of interaction with sound waves has been a more challenging undertaking. 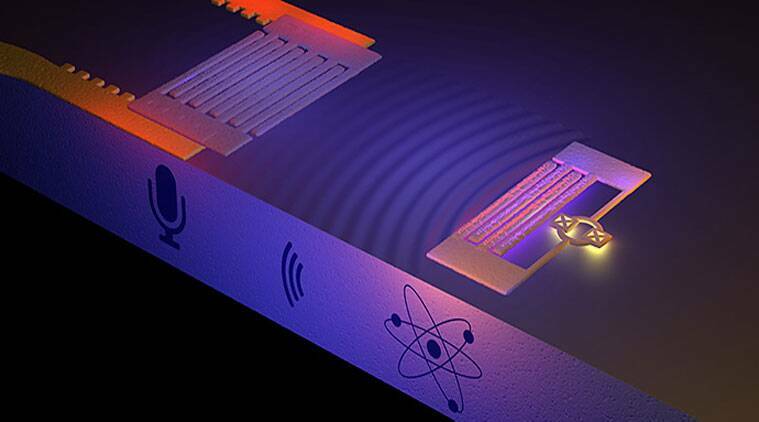 The researchers at the Chalmers University of Technology in Sweden have now succeeded in making acoustic waves couple to an artificial atom. “We have opened a new door into the quantum world by talking and listening to atoms,” said Per Delsing, head of the experimental research group. “Our long term goal is to harness quantum physics so that we can benefit from its laws, for example in extremely fast computers. We do this by making electrical circuits which obey quantum laws, that we can control and study,” said Delsing. An artificial atom is an example of such a quantum electrical circuit. Just like a regular atom, it can be charged up with energy which it subsequently emits in the form of a particle. This is usually a particle of light, but the atom in the Chalmers experiment is instead designed to both emit and absorb energy in the form of sound. “According to the theory, the sound from the atom is divided into quantum particles,” said Martin Gustafsson, the research article’s first author. “Such a particle is the weakest sound that can be detected,” said Gustafsson. “Due to the slow speed of sound, we will have time to control the quantum particles while they travel. This is difficult to achieve with light, which moves 100,000 times more quickly,” said Gustafsson. The low speed of sound also implies that it has a short wavelength compared to light. An atom that interacts with light waves is always much smaller than the wavelength. However, compared to the wavelength of sound, the atom can be much larger, which means that its properties can be better controlled, researchers said. For example, one can design the atom to couple only to certain acoustic frequencies or make the interaction with the sound extremely strong. The frequency used in the experiment is 4.8 gigahertz, close to the microwave frequencies common in modern wireless networks. In musical terms, this corresponds approximately to about 20 octaves above the highest note on a grand piano. The study appears in the journal Science.